Wire fish are native to almost every continent on the planet, even Antarctica (although they tend to be rather brittle). Their habitats include walls, ceilings, and really dark nasty places. Plecostomus cuprum is not particularly self-sufficient. You’ll find this creature in aquariums at most electrical contractors. Unlike many aquarium species, this one actually thrives in waters with high concentrations of heavy metals (like copper, duh!) for obvious reasons. The above image is just an artists rendition. It’s a happy fish, as you can clearly see. It’s good to be a wire fish especially in the current booming construction market. The variety shown above is the 2-copper wire + ground variety. It’s a bit unusual due to it’s ability to extrude 10-guage wire. For those of you who don’t know what a real fish is, here’s a picture of one that’s been only slightly abused. 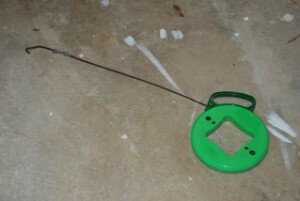 The coil inside is about 50 feet long and helps fish wire through walls and ceiling. We found more evidence of the elusive wire fish today (February 8th). 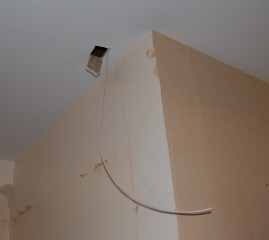 Pictured here, is an entry hole that the wire fish, with it’s wire trail clearly showing, used to get into the ceiling.